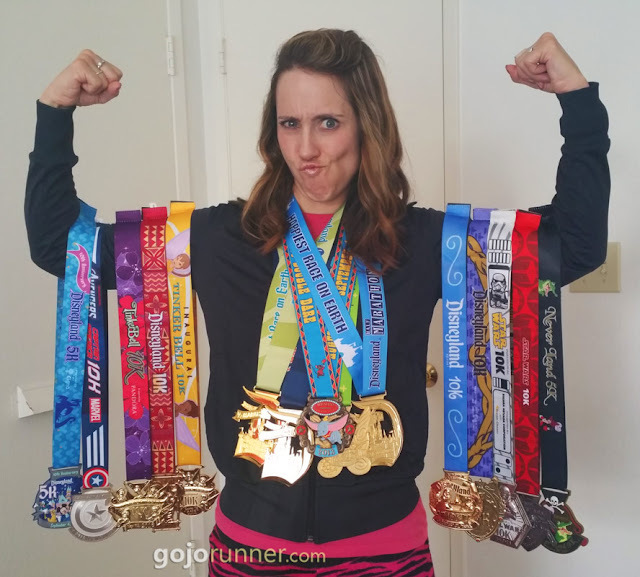 I've run a lot of races, but I have never run a race like this before. A year ago, when my dad suggested that my family fly to China and run a half marathon on the Great Wall, I smiled and thought, "That is too epic to actually happen." The experience was once-in-a-lifetime, and completely epic-tastic. 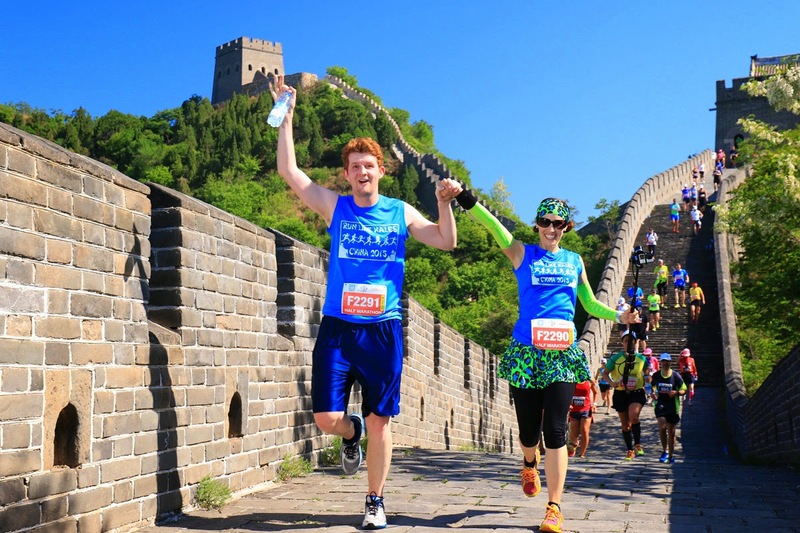 I'll admit, growing up, I didn't think the Great Wall sounded too impressive. I probably looked at my bedroom walls and thought, "They're okay, I guess." But this wall is seriously cooler than my bedroom walls. Its construction began around 700 BC and didn't stop until a few hundred years ago. Throughout its thousands of years of construction, it's said to have reached a length of more than 13-thousand miles -- more than half the length of the earth's equator. That's a friggin' long wall! Bravo, China! Apparently working on the wall was so difficult that as many as a million forcibly recruited peasants, soldiers, convicts, and prisoners of war died constructing it, and instead of burying or cremating some of the bodies, wall construction continued right over some of them, and their bones are still inside the wall. For that reason, it's been nicknamed "the longest cemetery on earth." Nothing like running a race through a long cemetery to show respect for those who have passed on.... er.... new paragraph. Only a tenth or so of the wall length remains today, but it looks pretty amazing. Seven us ran the Great Wall race together -- my dad, two brothers, sister, brother-in-law, and my husband. We wore team shirts that said "Run Like Hales" -- paying homage to our family name, of course. 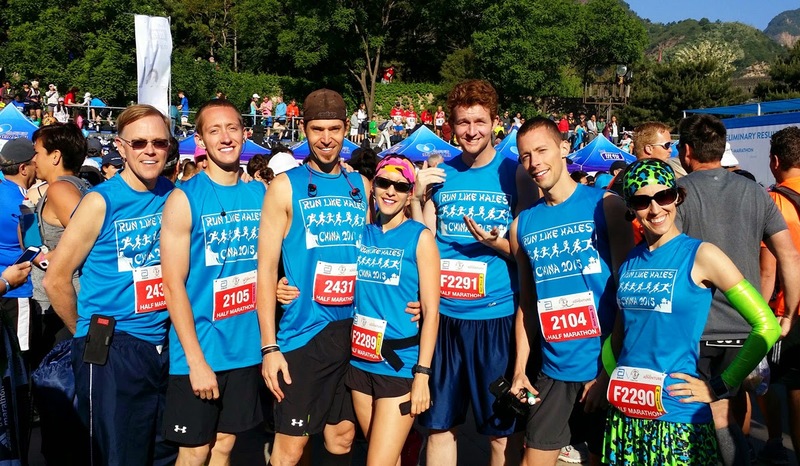 There were three race options -- a fun run (5+ miles), a half marathon (13.1 miles), and a full marathon (26.2 miles). We opted for the half, but I really want to go back and run the full someday. My poor husband -- apparently he got registered as a female somehow, so he got to sport a nice "F" on his bib. Hahaha, I guess I'm gay! The race started and ended at a place called Ying & Yang Square, just at the base of the Great Wall a couple hours from Beijing by bus, and the area has surprisingly remained undiscovered by tourists (other than us runners, of course -- perhaps a bit of culture shock for everyone when we all come to town). 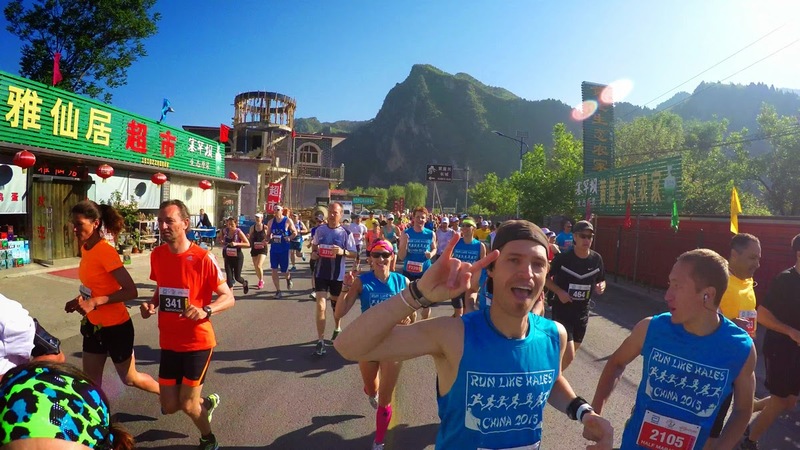 All three race courses started by running 3 miles on a Chinese town road. 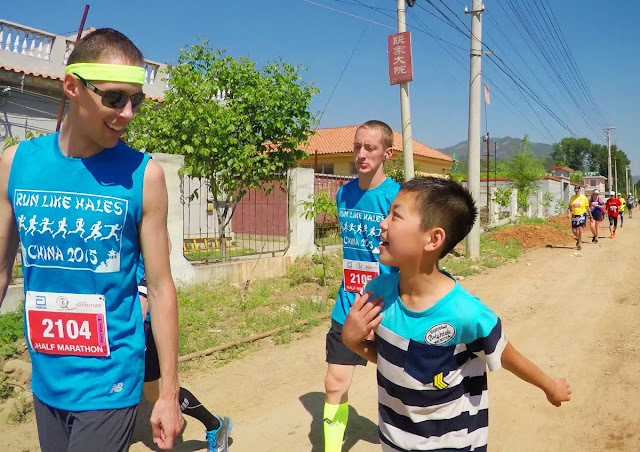 The beginning of the race -- running the town streets in China. After a long run uphill, we hit the wall. Well, not in the sense that runners normally "hit the wall." We got to the wall. 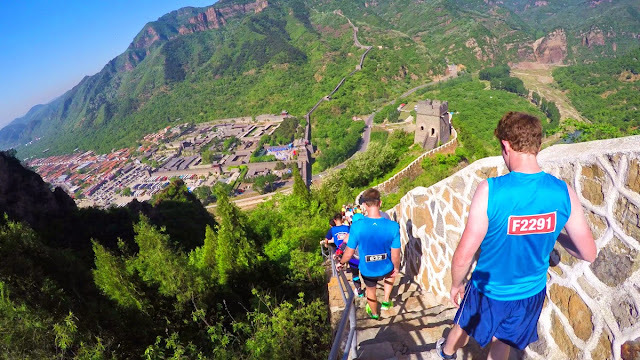 And thus began two scenic miles on the Great Wall of China itself. The steps were something to be reckoned with, but the views were incredible, and the energy was contagious. It was awesome. 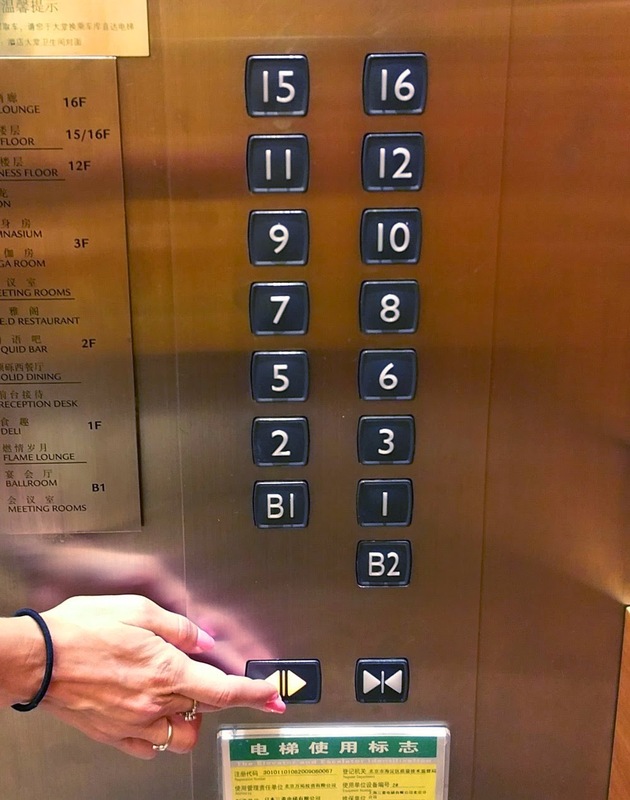 The full marathon boasts 5,164 steps -- both up and down. I think the half runs about 2,500-ish. After the wall, we passed by cheering spectators at Ying & Yang square where the fun run participants finished, and the half marathon and marathon runners continued down a few more town streets and into an amazing and completely authentic Chinese village, where many of the residents came out of their homes and cheered for the runners. 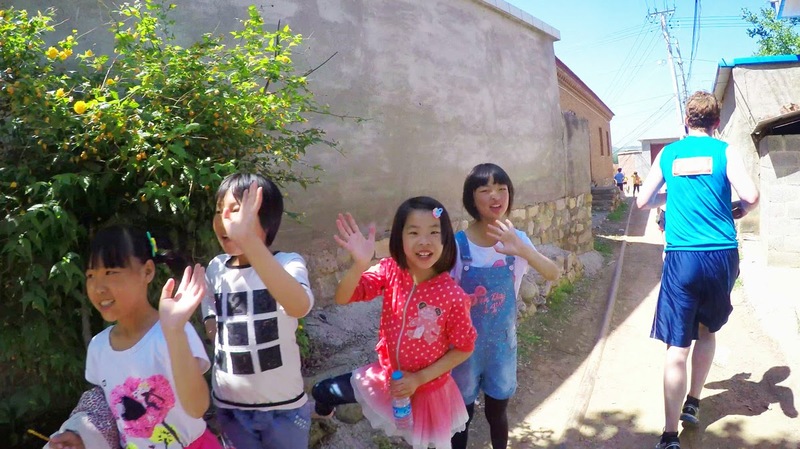 Kids cheered us on as we ran through their village. 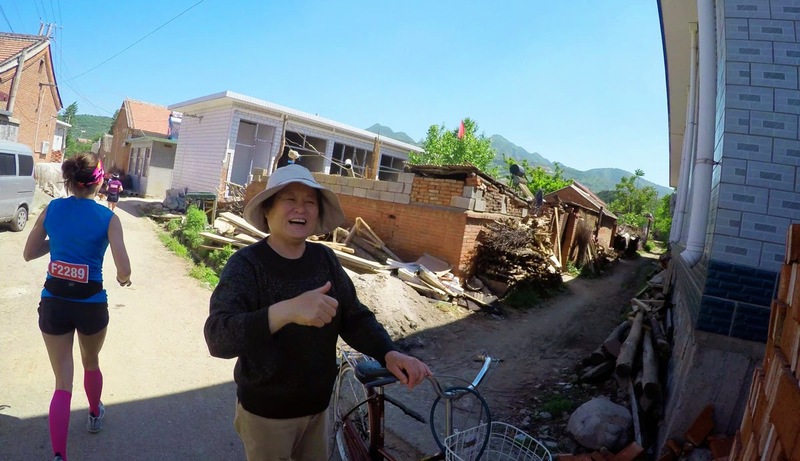 A local village resident gives us a thumbs up. I loved meeting the amazing villagers and seeing the way they lived. It truly made me reflect on my own life. They were so kind and happy to see us, even though we didn't speak the same language. One sweet little girl gave me a flower that she had picked. She'll never know that I sentimentally dried it and pinned it to the bulletin board in my living room. 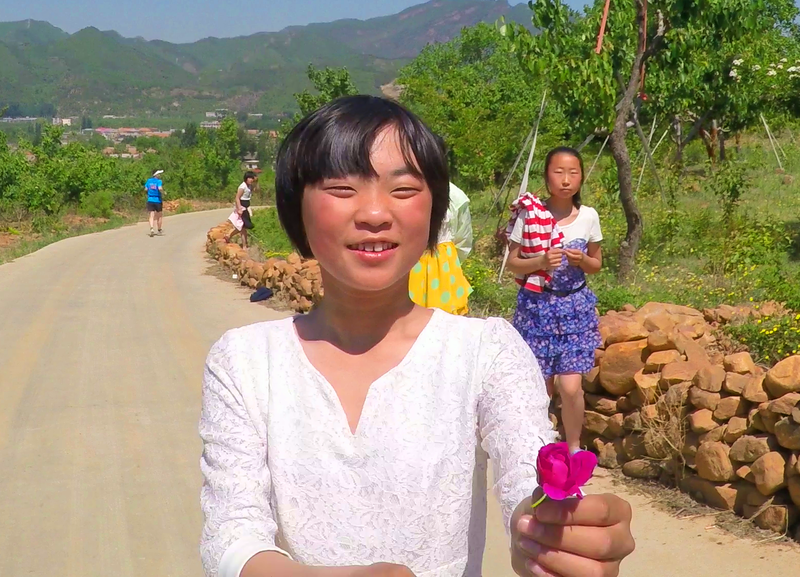 These little girls were picking and handing out flowers to runners. 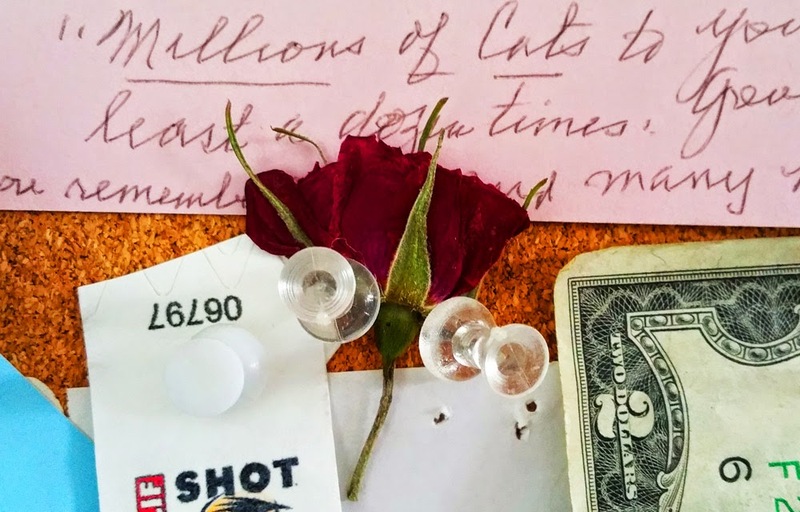 I pinned my flower to my wall. The full marathoners put in some additional mileage around the village, and then everyone turned around and headed back to Ying & Yang Square, where the half marathoners finished. Another group of half marathoners runs toward the finish line. The full marathoners, however, passed through the square and went on to conquer 2-thousand more steps over the final 6 miles of their race. 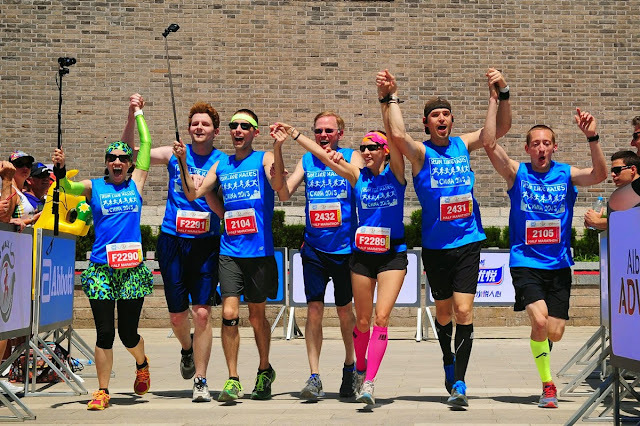 Out of our tour group of about 40 people, two full marathoners got heat exhaustion and couldn't complete the race -- one around mile 16, and another around mile 22. That's how tough it is. 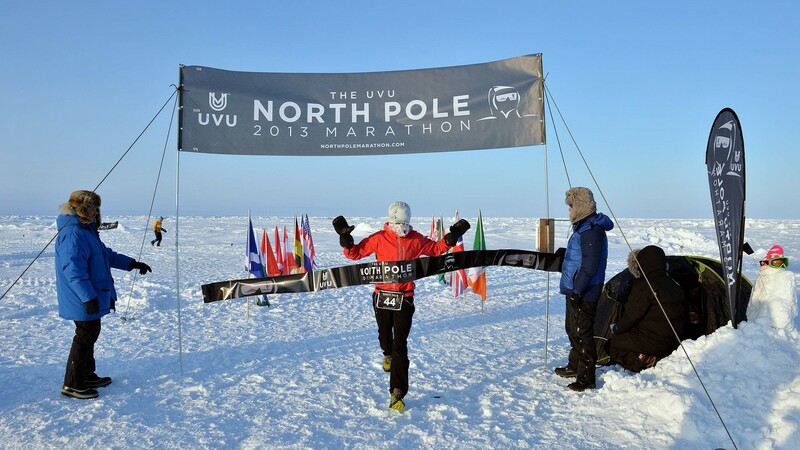 The race is named as one of the most difficult races on the planet, for obvious reasons. North Pole Marathon -- more difficult that the Great Wall Marathon. Our family decided to stick together during the race. While we are typically sub-2 hour half marathon finishers, we decided to squelch our natural competitive nature and take it slow (though this excuse will only work once). Not to mention, three of the seven of us were injured and another one of us (lucky me) was sick -- I have lots of medications to thank for the smiley video. There was no way I was gonna sit that one out! Though I pretty much haven't gotten out of bed since. Worth it! Since my brother speaks Mandarin fluently (awesome, right? 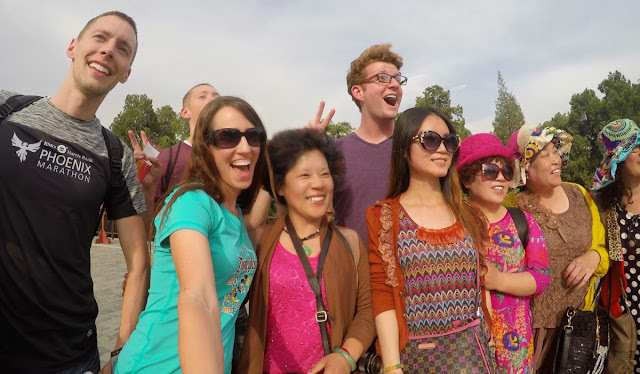 ), we stopped and talked to a few native Chinese. I just watched, smiled, and filmed them like any dumb American would. 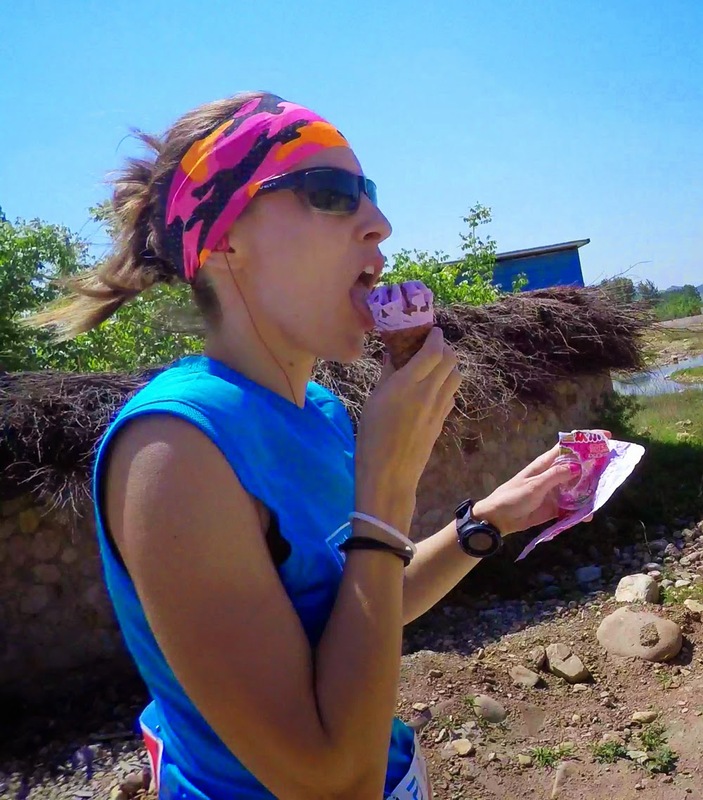 We even paused and bought ice cream from a local peddler, who laughed her head off when some American runners knocked on her door and asked her for ice cream. My sister Christy, running and eating an ice cream cone at the same time. Slowest half marathon any of us have ever "run." Darn proud! 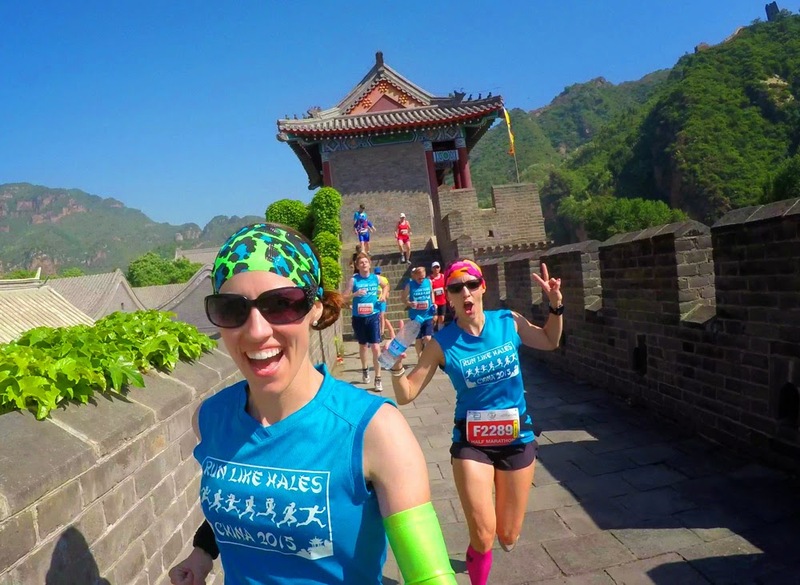 Honestly, if you're a runner -- put this race on your bucket list. It's organized, challenging, fun, and a cultural experience beyond anything you've been through. I'll be posting a formal video review on the experience in an upcoming post, as well as some footage of Beijing, so stay tuned. In the meantime, run like Hales! 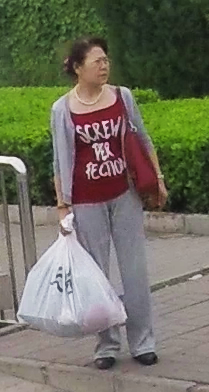 China was full of surprises. 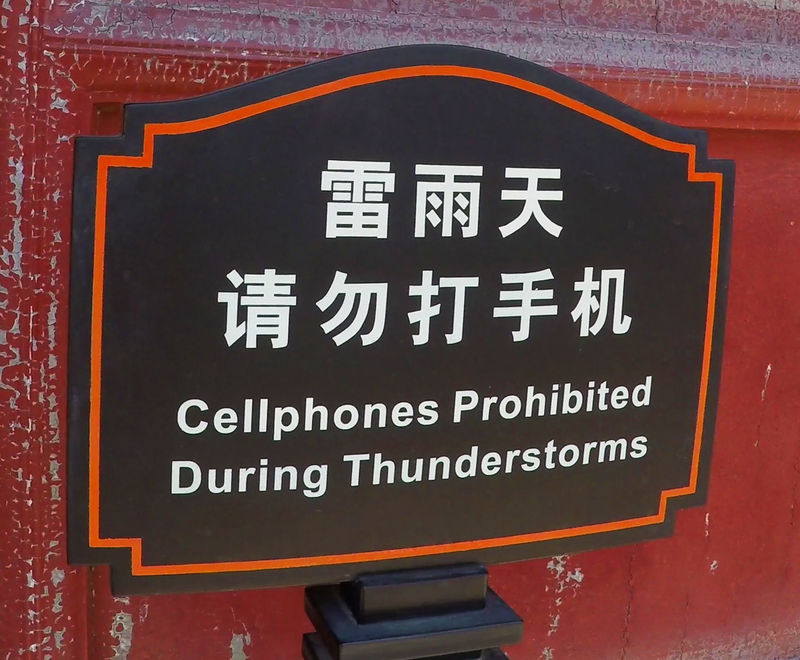 And I think we came with a few surprises for China. 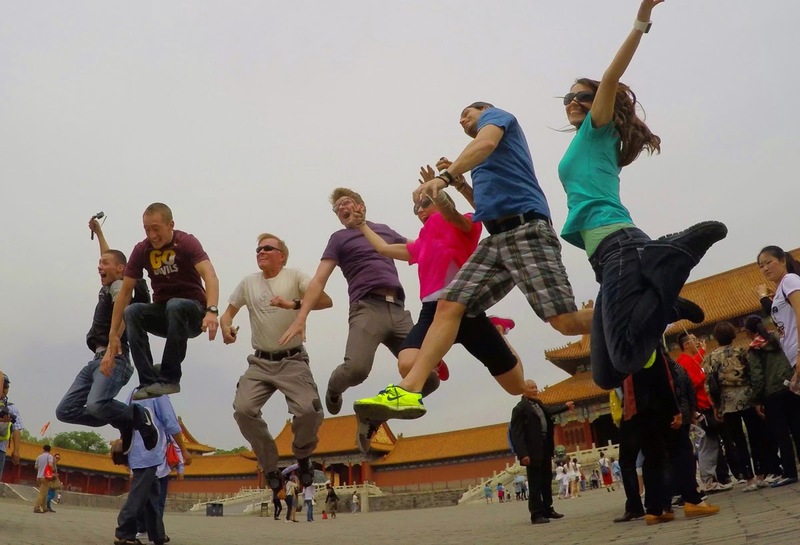 I don't think many of the Chinese were used to seeing a crazy family taking a jumping picture in the middle of the Forbidden City. Clearly we didn't respect the location's name. 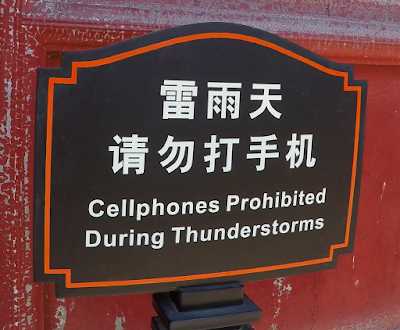 One of my favorite parts about China was their written English. 7-11? Gotta admire them getting to the point. To be honest, I was surprised that almost all street and building signs in Beijing had an English title in addition to the Chinese title. Most of the time, their English was spot-on. 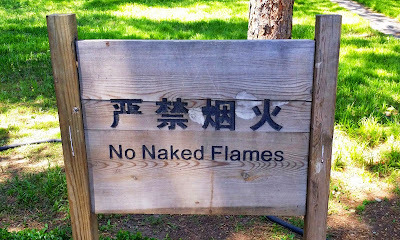 But every now and then, something got a little lost in translation. 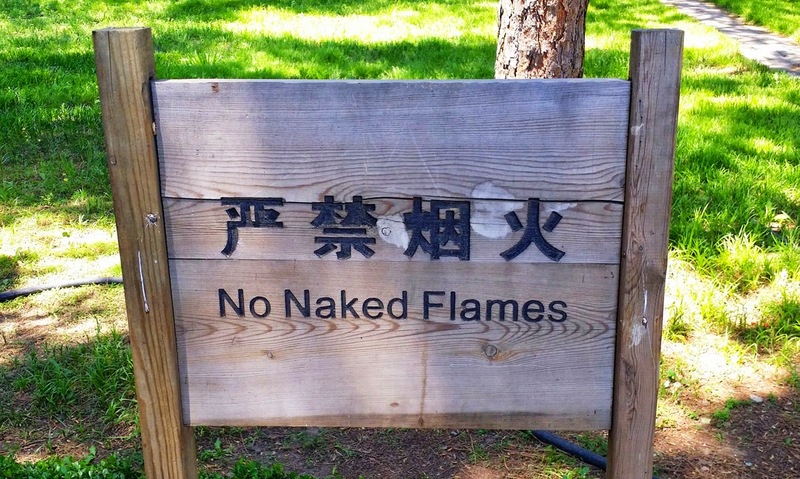 They prefer their flames fully clothed, thank you. Don't you go striding and un-cherishing those relics, now! This one just confused me. This English was apparently translated by the prophet Isaiah. Something tells me this nice lady might not know what her shirt says. All this being said, I can smile all I want at these interpretations of my first (and only) language, but if someone from China told me I could either draw one Chinese character correctly or I would have my tongue glued to the bottom of my chin for the rest of my life, I would be inevitably subjected to looking a lot weirder than Gene Simmons, and being a whole lot less popular and wealthy. Chinese might not ace the English interpretation every time around, but I'm willing to bet there are a lot more Americans walking around with tattoos they think say "strength," when they really say something like "pork rind." 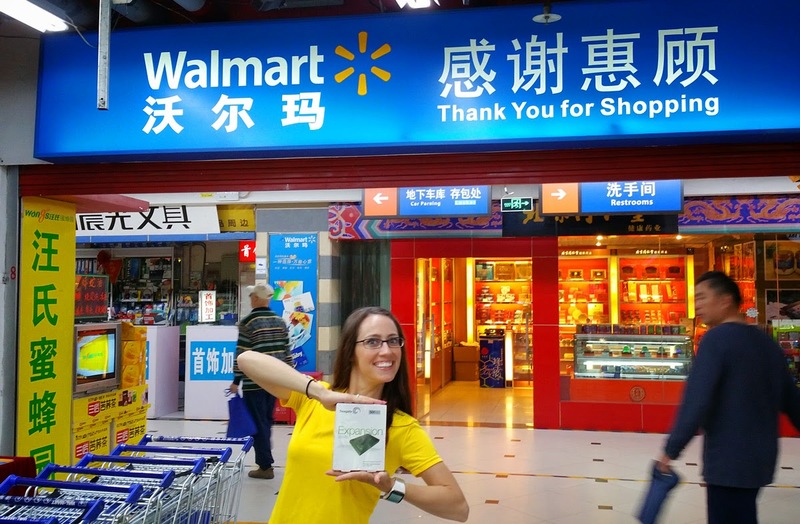 Because the Chinese government controls pretty much everything in China, including what information gets out to their citizens, Google, Facebook, and pretty much any other time-sucking site is not accessible through WiFi (or any Internet) connections. This means no Gmail, Blogspot, Wikipedia, Skype, Twitter, Facebook, or weird online dating sites. China apparently has their own versions of many of these sites, but they're obviously in Chinese and regulated by the government. 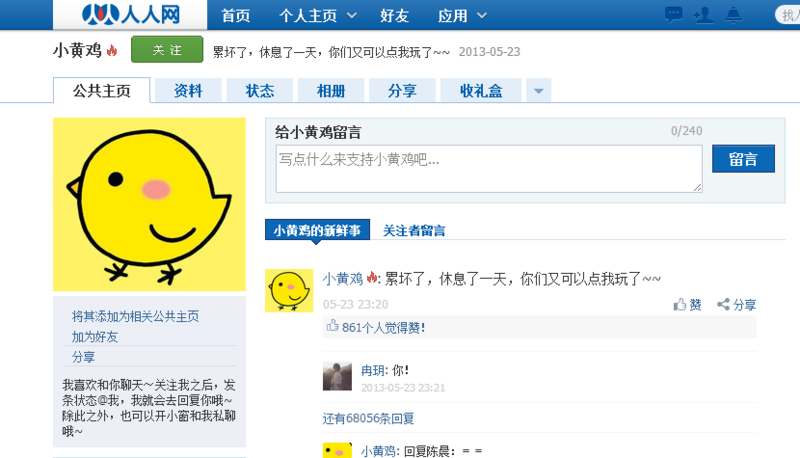 The Chinese version of Facebook, called "Renren," has 200 million users. A few members of my family purchased month-long VPNs, which allowed them to access these blocked sites, and they let me check my email a couple times. But for the most part, I just took a vacation from the Internet for a week. Admittedly, I'm a bit of an uncultured idiot when it comes to going outside of the country. I've been to Europe, but the culture there was pretty western, and I've been to Canada, which was just like the United States except my cell phone didn't work, and when I went to Mexico for my honeymoon, I stayed in an all-inclusive resort with a bunch of Americans, Canadians, and Europeans. So I wouldn't really call me "cultured" in terms of getting out and seeing how people of all different lifestyles live. We stayed in the Park Plaza Hotel, right next to the MasterCard basketball arena. 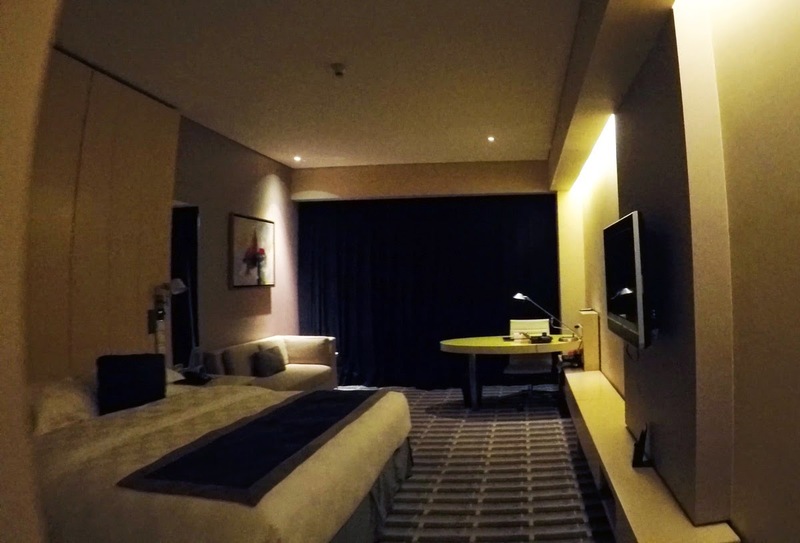 I don't know if I was expecting to stay in a hotel room that was like a motel 6 with mud walls and blankets on the ground or what, but when I opened my hotel room door for the first time and saw it looked exactly like a nice American hotel, I was quite pleasantly and naively surprised. Though -- apparently the Chinese government only allows specific hotels to let foreigners stay there, which makes sense, since our hotel was clearly catering to foreigners and not Chinese visitors (and after observing a few non-foreigner hotels from a distance, I suspect the experience there could be quite different). The electrical outlets fit pretty much every plug across the globe, though make sure you bring a down-converter if you're from the U.S. and don't want to deep fry your iPad. They even provided a hair dryer, and our TV channels included CNN and HBO -- both in English. 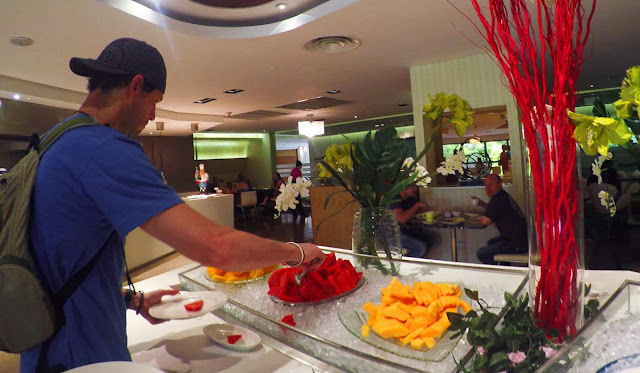 The complimentary breakfast each morning was shockingly better than most U.S. "continental breakfasts," with bacon, eggs, rolls, cheese, fruit, and a bunch of yumminess even the pickiest eaters like myself were more than happy with. The only real differences with our Chinese hotel were that smoking was allowed inside, and complimentary bottled water is provided so you don't drink out of the faucet and bring home a souvenir parasite. The Great Wall IS Great! It's a wall. So what? So... it's awesome! 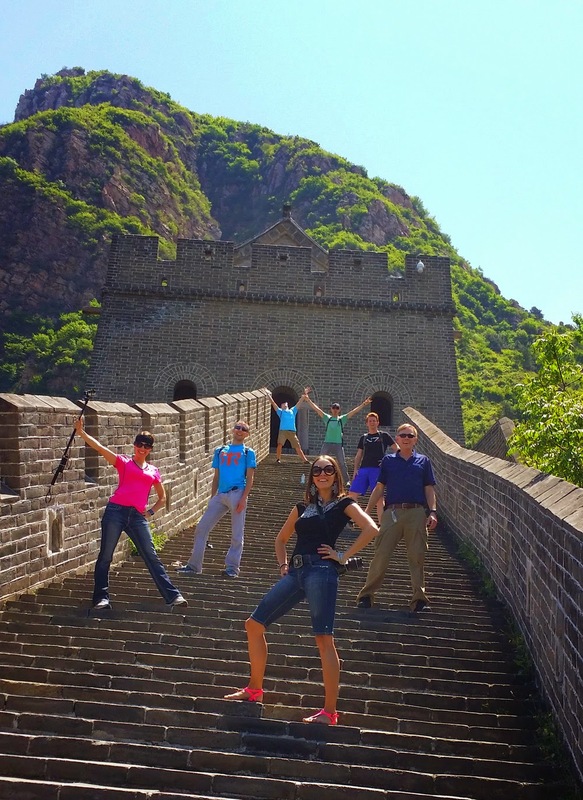 The Great Wall of China was a two hour bus ride away from our hotel through narrow winding mountain roads. Driving to the wall for the first time. 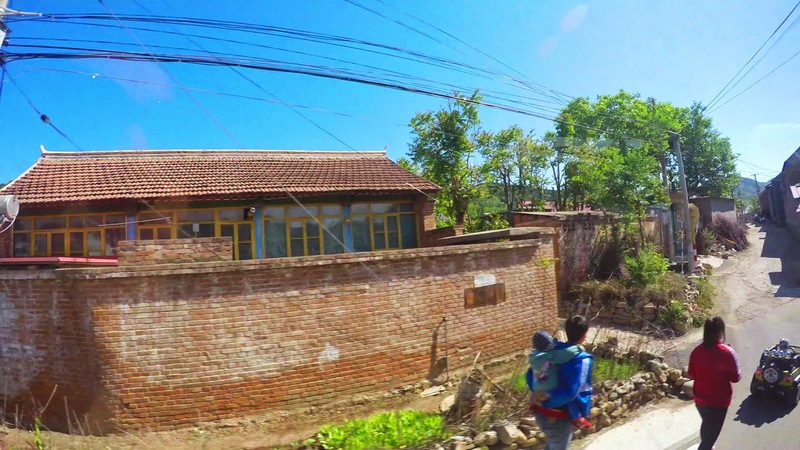 Since we didn't know what to expect, whenever we saw a brick wall or a pile of rocks on the side of the road, one of us asked if it was part of the Great Wall. It might have been funnier if we had been joking. 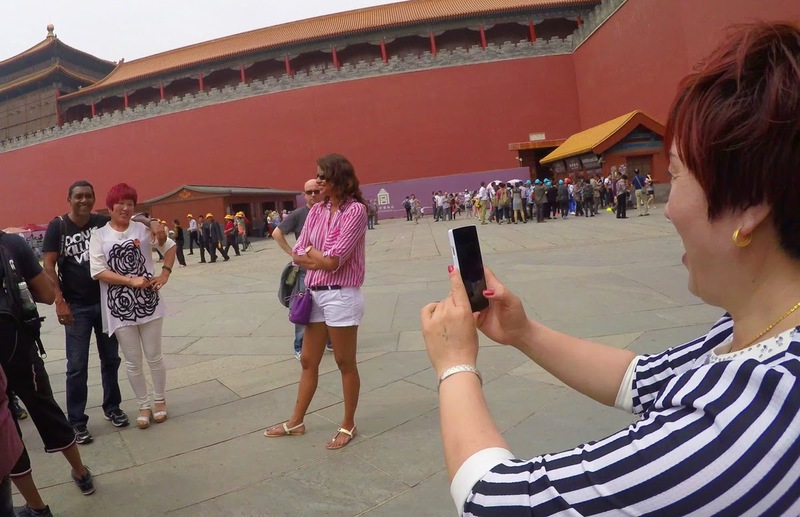 Is that the Great Wall of China? No. So when we finally came around the final curve and saw the wall for the first time, it was seriously epic. Much better than a pile of rocks on the side of the road. It doesn't just sit on the mountain side, but it sits high on the steep and jagged mountain side, among nothing but luscious green vegetation. It blew my mind to think that human beings built that thing by hand so many years ago. One of the best parts is that this particular part of the wall has remained virtually undiscovered by tourists (don't you all go flooding to the wall, now... though since Mom might be my only reader, I guess the risk is low). The wall and its courtyard sit just above a humble village, and most of its patrons are local Chinese. It was so natural and rustic, we were lucky to even find a Mr. Hole there. 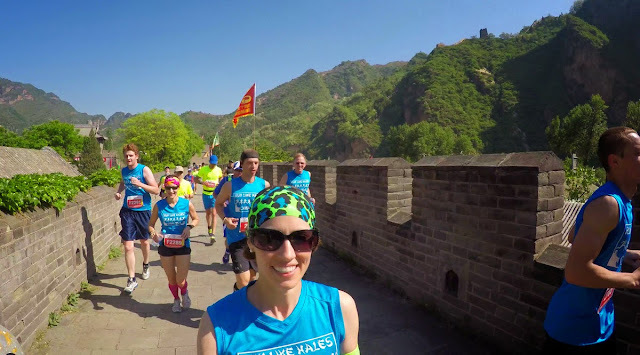 All of us runners visited the wall twice -- once to walk part of the race route in preparation, and then two days later for the actual race. Both visits were scenic, historic, cultural (yay! ), and amazing -- totally exceeding expectations. At "T-M&M" Square -- I have no idea how to spell the actual location. 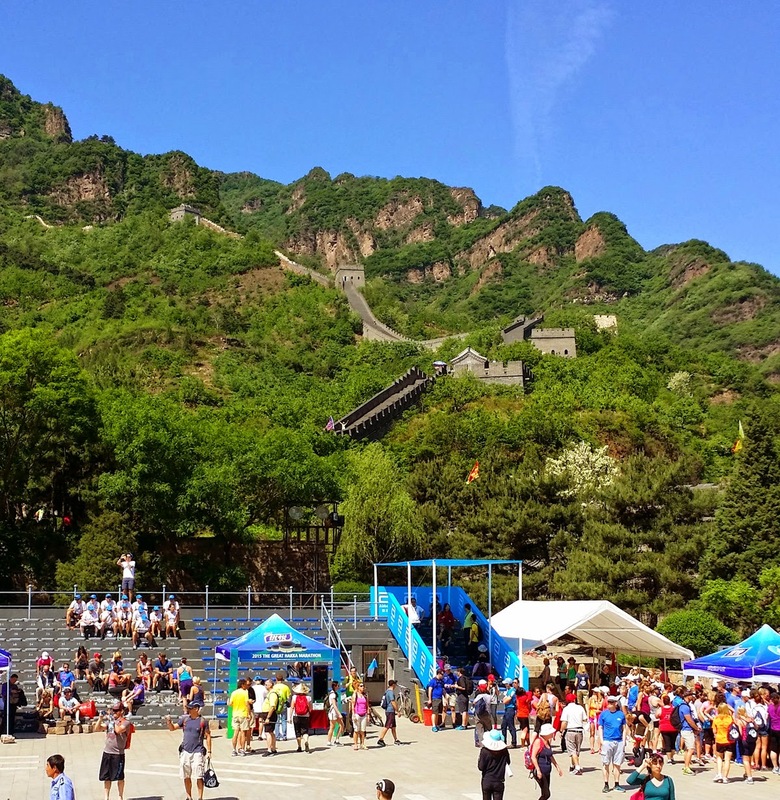 Yesterday my family and I got home from an epic adventure to Beijing, China, to run the Great Wall Half Marathon. The trip was ridiculously amazing -- I have to break it up into a few posts. 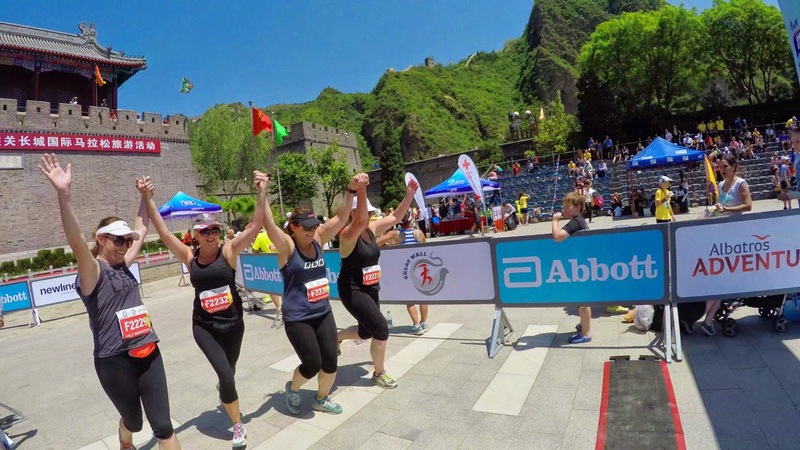 Finishing the Great Wall Half Marathon as a family. To start, I had no idea what to expect about China. I wanted to be surprised. Right when our flight touched down at Beijing Airport, my sister and I walked into a bathroom. When I stepped into a stall to do my business, I realized the stall was missing something... the toilet. Instead, there was a hole in the ground. The heck? This was a bathroom at a large international airport that hosted the world at the 2008 Olympics -- shouldn't it have toilets? Confused, I just stood there, staring at the hole. "Psst, Christy!" I whispered loudly enough for my sister to hear, while attempting to squelch the title of stereotypically loud American. "Does your stall have...." I couldn't believe I was asking this, "...a toilet?" "Uhh, mine just has a hole in the ground." I ended up opting out of the pop-a-squat hole in exchange for a turn at Christy's luxury throne this time around, but I would not be able to steer completely clear of Mr. Hole for long. 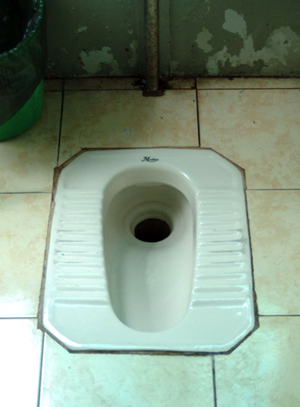 Apparently this flushable hole in the ground is the norm in China (yes -- for number one or number two), and that very few locations even have a sit-down toilet. This, by the way, totally takes the relaxation out of going to the bathroom -- don't bring a magazine into a Chinese squatty potty. The worst part (advanced apologies for the high nastiness factor of this paragraph) was that people just... well... can't aim, and usually a visit to Mr. Hole means standing in half an inch of other people's used-to-be orange juice, beer, or bottled water, while you struggle yourself not to be a floor content contributor. This is far cleaner than any of the ones I saw -- you're welcome. My sister was so revolted by Chinese public bathrooms that she pretty much stopped drinking liquids the whole week in order to avoid using any bathroom other than our hotel's. And I've gotta hand it to her -- she miraculously managed to never have to face Mr. Hole. As for me, with a bladder the size of a postage stamp, I became unfortunately well acquainted with Mr. Hole, though we are not, and never will be, friends. Red Light Means "Everyone GO!" Beijing is packed with more people than can fit on their streets, but that doesn't prevent anyone from taking to them anyway. Everywhere you look, there are scooters, bikes, cars, buses, and pedestrians. Few people wear seatbelts or helmets, and some bikes and scooters are so packed with bags that they look like the sleigh on "How the Grinch Stole Christmas." Wouldn't it be awesome if the Chinese could do this? Intersections have traffic lights, but from my observations, a green light for one lane actually means "everyone in sight start moving at the same time in every direction possible -- the biggest or fastest wins!" And pedestrians? They do NOT have the right of way! It blows my mind! Literally, even if a "walk" sign is lit at a crosswalk, every kind of wheeled contraption is cutting through pedestrians with millimeters to spare. The craziest part is -- no one crashes or hits anyone, and the Chinese are 100 percent unphased by this kind of sporadic and chaotic transportation culture. They honk at each other frequently, but the horn is only tapped lightly to notify others around you that you're there, as opposed to the more colorful message attached to honking in the United States. 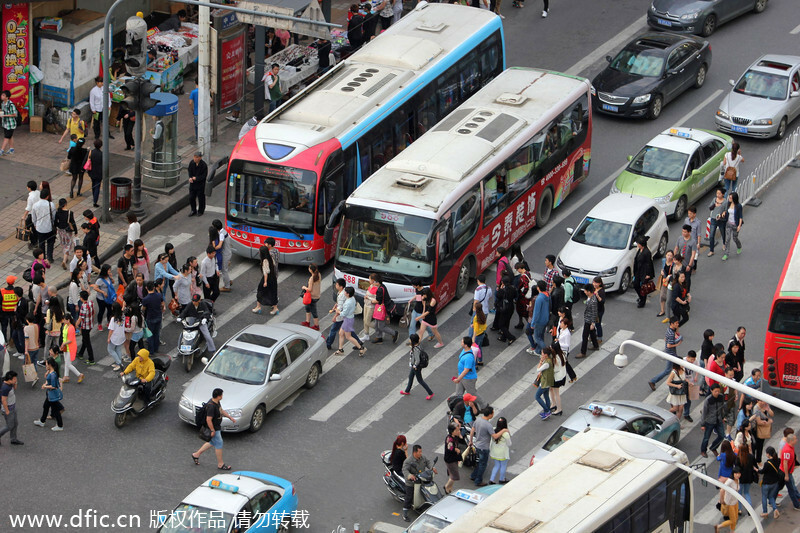 In China, there isn't road rage or yelling at each other -- it's just a cultural understanding that complete and constant chaos on the roads is not chaos at all. 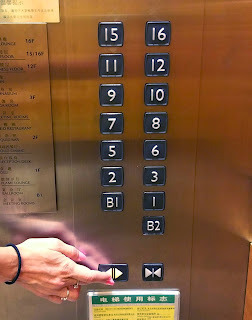 The lack of order, since expected, is orderly. Mind = blown. 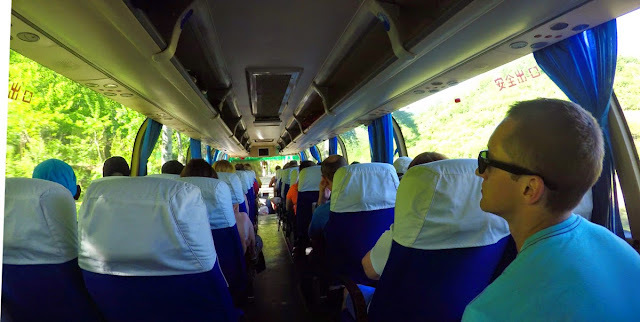 Us tourists, on the other hand, gasped, held our breath, and covered our eyes on a regular basis everywhere the bus took us. By the time our bus driver flipped his seventh u-turn at a red light in the middle of a busy intersection narrowly missing a signpost, rooftop, and a woman in a wheelchair, we stopped looking out the windows. Ever had to put your name on a 30-minute wait list to be guided through glass doors, up a fancy staircase, and seated by a server holding leather-bound menus offering everything from shrimp cocktails to fancy wines -- at a friggin' Pizza Hut? Waiting for our name to be called to eat at Pizza Hut in Beijing. Not even kidding -- China's Pizza Hut makes the United State's pizza look like poopzza. 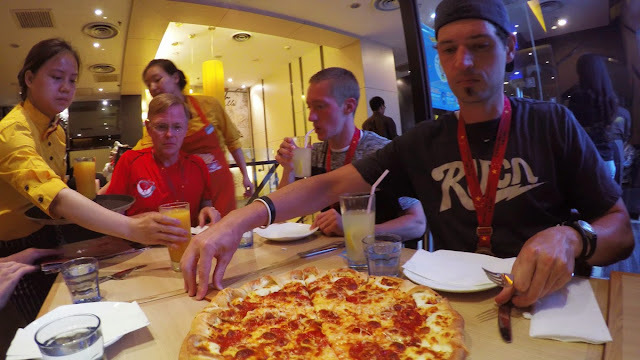 While admittedly our craving for "normal" food after eating a dozen Chinese meals in a row may have influenced our bias toward this China pizza experience slightly, I stand by the fact that I would have been impressed regardless. The seven of us inhaled two large and deliciously cheesy pizzas in T-minus 60 seconds. It was so yummy! 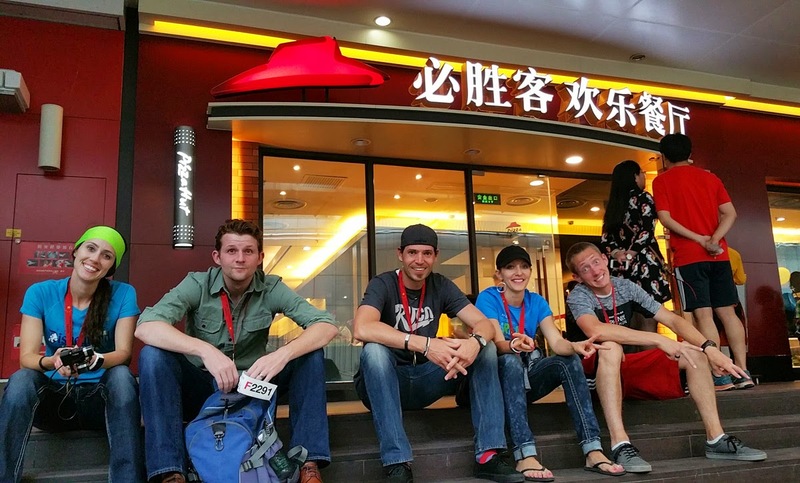 I never thought I'd be saying this, but if you visit China, you have to go to a Pizza Hut. And to further amaze with unexpected advice, be sure to get there early so you can get your name on the wait list. When we weren't running on the Great Wall, we spent much of our time exploring all the tourist-magnet hot spots in Beijing. And just like how we Americans like to tour different parts of our own country, these Beijing tourist traps were stock full of Chinese from all other parts of China, complete with group guides leading with bright flags of different colors. Our tour group consisted of runners from all over the world -- Iceland, Sweden, Trinidad, England, New Zealand, Switzerland, Canada, Spain -- the list continues. 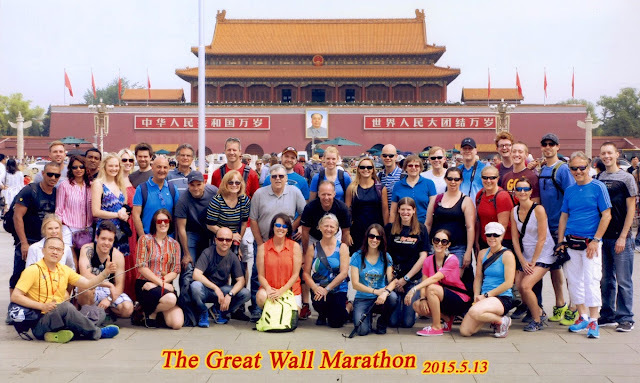 Our tour group of Great Wall runners -- awesome people from all around the world. Since we stuck out like a sore thumb in a sea of Chinese, as we walked around, often the Chinese would approach us and either ask to take a picture with us, or just stand in front of us and have their picture taken without asking. It was hilarious. Getting asked to have our picture taken. Our three friends from Trinidad were often the only black people in sight, so they might as well have all been Lebron James. Chinese don't see black people very often, hahaha. And anyone with blond hair was an instant camera target, too. 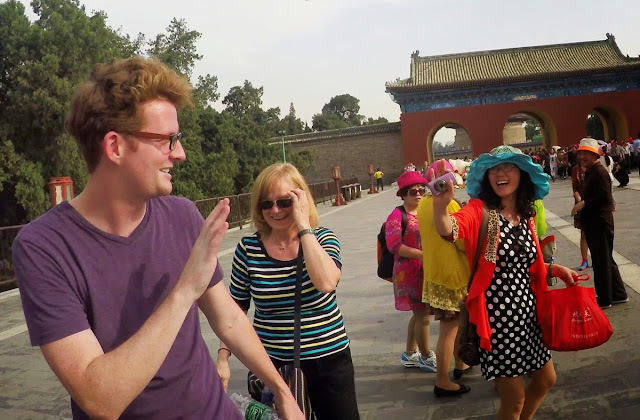 My family was frequently pulled into pictures just for looking like a bunch of white people, and the Chinese were so excited, it was completely endearing and we were happy to oblige. So much to write, and so little time! Stay tuned for more adventures in China!